Coins are such ordinary, everyday objects that we hardly pay attention to them, but it’s hard to imagine a day without the small transactions they make possible. No less taken for granted is that worldwide all are official products of governments, and as such, they often bear simple but fundamental names, images and ideas that say much about that government. It is the Lydians of what is now western Turkey who are credited with the invention of coinage around 600 bce when they stamped their symbol of state on pieces of metal as a guarantee of value. Ever since, coins have proven to have value also as historical records, cultural keys, evidence of trade, relations between states and the extent of a particular economy. They are all the more valuable when written sources are absent or problematic. Such is particularly the case in the mid-seventh century ce, during the first decades of Islam in the Levant, Mesopotamia and Persia. The historical texts we have were mostly written a century or more after the events they describe. Especially scant are records of the first decades of Islam, from the death of the Prophet Muhammad in 632 ce to the mid-700s, that could inform us about the workings of the early caliphate and daily life in its provinces. During the lifetime of Muhammad, Arabia did not issue its own coins, and coins are rarely mentioned in the Qur’an. For commerce, gold coins from the Byzantine Empire and silver ones from Persia were circulating, but they were used as bullion by weight rather than as coins with a fixed and often arbitrary value. When the Arabs expanded into the Near East in the middle of the seventh century, however, they came into close contact with societies that had issued coins for centuries. The Byzantines, who ruled what is now Turkey, Syria, Palestine and Egypt, produced gold and copper coins while the Persian Sassanids, who dominated today’s Iran and much of Iraq and Afghanistan, relied largely on silver. In all cases, their coins bore an image of the ruler and an indication of religion: crosses for the Byzantine Christians and fire altars for the Persian Zoroastrians. The most common types of coins in the Byzantine realms were copper; the largest was somewhat larger than a us quarter or one Euro, and it carried an “M”, the Greek number for a denomination of 40 nummi. The Persian realms used larger, thinner silver dirhams, a word derived from the Greek drachma. The Arabs rapidly adapted to this system by striking copper coins in Syria, Palestine and Egypt as well as silver ones in Iraq and Iran. While all types showed continuity with the local traditions, the issues in Syria were the most varied, while those of the Sassanid territories conformed most closely to existing standards. All offer surprises and insights into the situation in the Near East during the early period of Arab rule. The first surprise is that actual Byzantine coins continued to circulate extensively in Syria and Palestine for decades after the Arab conquest: gold ones endured longest, until the end of the seventh century; copper ones lasted some decades, until about 660 ce. Most of these copper coins were issues of Constans ii (r. 642-668 ce), and they showed the emperor on the obverse and “M” on the reverse. No one knows how these coins crossed the frontier between realms that were almost constantly at war. They seem too numerous to be explained exclusively by trade; the alternate explanation is a conscious Arab policy. 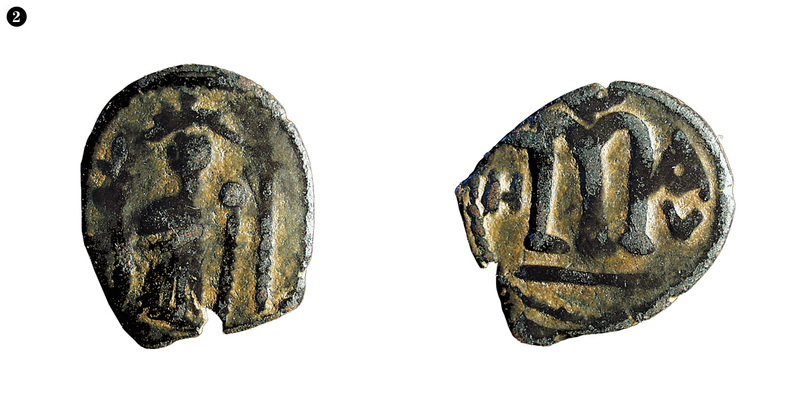 In any case, the coins reveal close economic ties between the rival powers of Byzantines and Arabs. 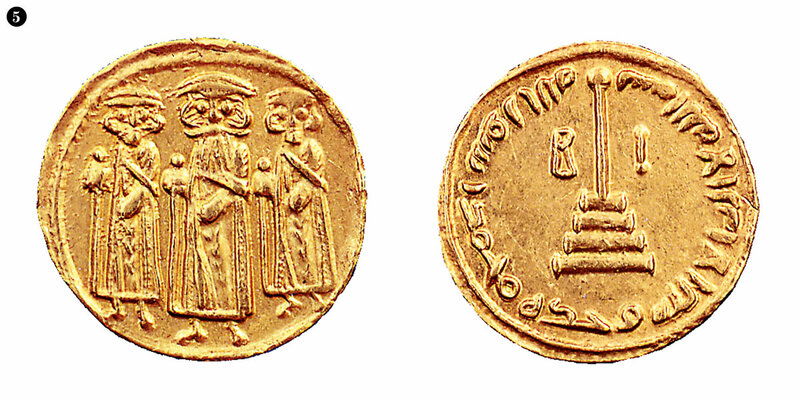 The Byzantine coins were joined by masses of imitations, some close to the originals and others in a bewildering variety of types derived from them. They seem to represent a chaotic period in which local officials took the minting of coins into their own hands, as we don’t know who issued them or much about when and where they were struck. It is hard to tell which, if any, of these imitations were the products of government authorities, but some types have symbols or inscriptions that suggest organization, even if they remain ambiguous or inscrutable. 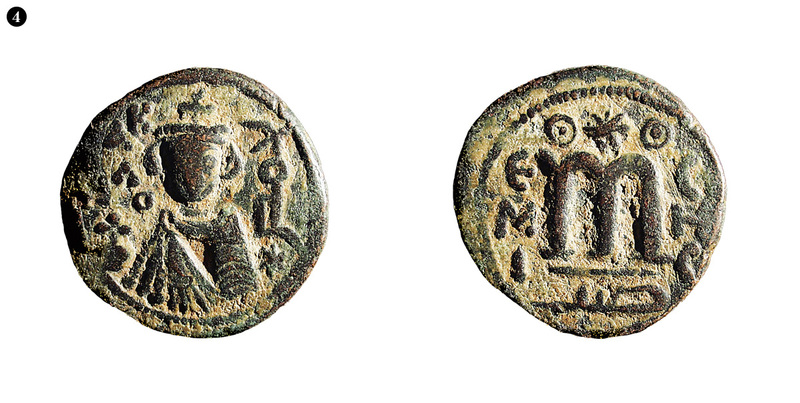 Many of these coins follow Byzantine convention: The imperial figure has crosses in his hands and on his crown, and the denomination on the reverse usually has a cross above it. #1 On others, however, the crosses were removed. #2 All were issued under Arab rule, and while some bear inscriptions in Arabic, there is nothing Islamic about them. Despite this setback, Mu’awiya introduced order to the minor coins in two stages. The first series featured the traditional standing imperial figure, but it added the name of the mints where they were struck in Greek or, in some cases, in both Greek and Arabic. The main issue similarly had inscriptions in Greek, Arabic or both, but with a distinctive type at each mint: a bust at Homs, in western Syria #4; a standing figure at Damascus; two figures at Baalbek (today in Lebanon); and so on. The issues of Damascus, the capital, circulated throughout Syria and Palestine, indicating widespread commerce. These new bilingual coins still functioned in a traditional context, with familiar Byzantine types and crosses prominently displayed. Most of the Syrian and Egyptian coins are far from being works of art; some of the early imitations even look like the work of a village blacksmith. The bilingual bronzes, on the other hand, are far better designed and struck than contemporary Byzantine issues. Likewise, the gold reflects careful design and execution, as fine as any coinage of the age anywhere. Several things are at work here. First, the conservative attitude that people have toward their money: In the us, for example, the one-dollar note has been virtually unchanged since 1928, and the portrait of Abraham Lincoln on the cent coin has been used continuously since 1909. In Britain, the seated figure of Britannia of the reverse of the penny lasted some 300 years. Likewise, in Syria the Byzantine types continued long after Byzantine rule. They thus represent cultural continuity: People lived in the same towns and villages; they traded with many of the same merchants; they used the same pottery and, for it all, the same coins. Perhaps most important, though, is that these coins indicate tolerance and accommodation on the part of the early caliphate. The 20-year reign of Caliph ‘Abd al-Malik, the fifth Umayyad caliph, which began in 685 ce , reflected a more distinctly Islamic program, manifested most dramatically in the construction of Jerusalem’s Haram al-Sharif (Dome of the Rock) and his edict to conduct all government business in Arabic. In coins, experimentation marked his first years: The caliph replaced the imperial figure, the cross disappeared, the inscriptions became exclusively Arabic and—for the first time—words from the Qur’an appeared. From then on, Islam was typically proclaimed on all coinage. Whether or not the coins single-handedly really provoked war, they certainly played an important role in relations between the hostile states, and they served as an important vehicle of propaganda. The next stage of establishing a new Arab coin system brought standardization, with the image of the caliph on gold, silver and copper. The precious metal coins are rare today, but the copper ones, issued at 16 mints, are common. 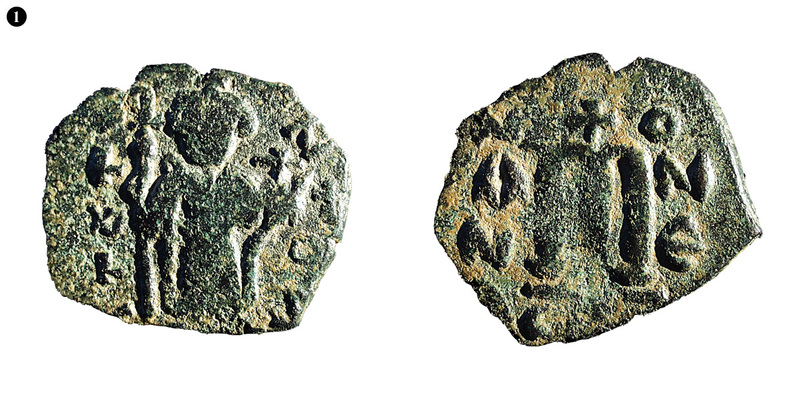 Several of these mints were in the frontier regions from which armies were deployed against Byzantium, suggesting that the coins were produced for the military or its suppliers. 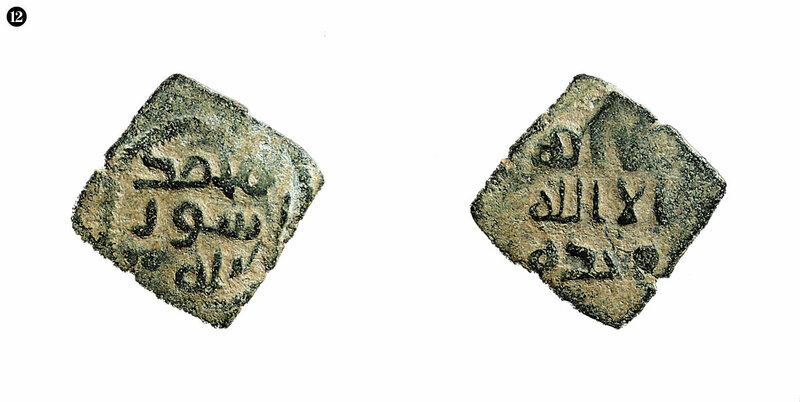 For the first time, the coins bore the figure of the caliph, who is identified as “The servant of God ‘Abd al-Malik, commander of the believers,” and on the reverse there appeared an object that has been identified as the qutb (rod or staff) symbolizing the caliph’s spiritual guidance, with the shahadah set around it. 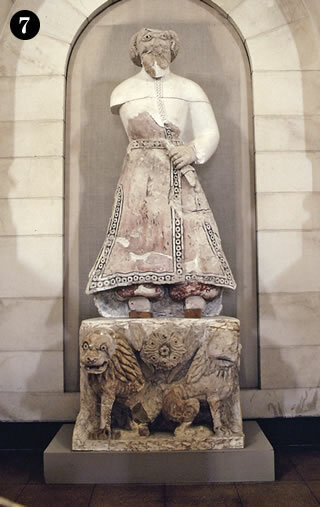 #6 The figure of the caliph was likely a common one: This one is strikingly similar to the statue #7 found in the Umayyad palace at Khirbat al-Mafjar, near Jericho. These coins were issued for four years, from about 693 to 697. In Egypt, coins of the same period show much less variety. Egypt was far more centralized politically, and it used only one mint, in Alexandria. Its small, thick copper coins (no gold or silver was issued there) followed the same general development as the Syrian ones, though employing a different denomination. They began with imitations of the Byzantine, with the mintmark, “ALEX.” These yielded to a type inscribed, “MASR”, which was the Arabic name for the new Islamic capital at Fustat, now in southern Cairo. 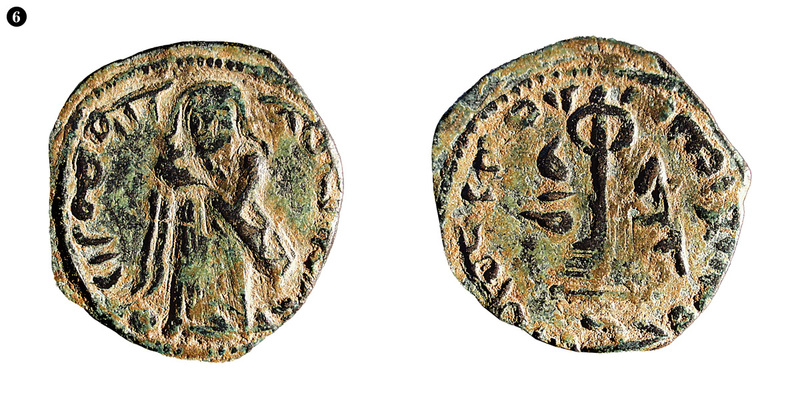 Another series shows “ABAZ” in place of the mintmark, evidently representing the name of ‘Abd al-Aziz, governor of Egypt and brother of Caliph ‘Abd al-Malik. #8 This type no longer bore the crosses that featured on the earlier issues. Egyptian coins rarely circulated in Syria, and likewise, Syrian coins are virtually never found in Egypt, which shows that Syria and Egypt formed largely separate economic zones. So far, the imagery of the Arab-issued coins largely fit the established pattern: the figure of a ruler on the obverse and another culturally distinctive figure or symbol on the reverse. But at the close of the seventh century, ‘Abd al-Malik had united the empire and began to strike a universal coinage at mints throughout the caliphate. Beginning in 77 ah (697 ce), an entirely new type of gold coin appeared, one showing Arabic inscriptions alone, mostly from the Qur’an. On the obverse: “There is no god but God alone / He has no associate / Muhammad is the Messenger of God” and “He sent him with guidance and the true religion to make it victorious over every religion.” On the reverse: “God is one, God is eternal / He did not give birth and He was not born” and “In the name of God, this dinar was struck in the year 79.” #11 The silver, with even longer inscriptions, followed two years later, as did the copper, whose smaller size was suitable only for the shahadah. Today, these gold and silver coins (together with the mosaics inside the Dome of the Rock) represent the oldest surviving texts of verses of the Qur’an. At the same time, the old copper coins of Syria, with their Byzantine images, were called in and re-struck with the new inscriptional types. #12 This fundamental reform produced a truly Islamic, universal coinage, suitable to a united polity. Ever since, coins of Islamic countries have, with very few exceptions, avoided depictions of the human figure. So, what do the coins tell us? In economic terms, they reveal a close connection with Byzantium for two decades after the conquest; they show that the whole region, city and country alike, remained on a money economy; they illustrate patterns of trade and military activity. Their cultural significance is even greater. They reveal the endurance of pre-Islamic symbols and, in Iran, rulers, for a half century or more, reflecting tolerance and accommodation during the age of transition from classical antiquity to Islam. Clive Foss is retired from teaching history at Georgetown University. He lives in Cambridge, Massachusetts, where he collects coins and writes on Byzantine and early Islamic history, archeology and numismatics.